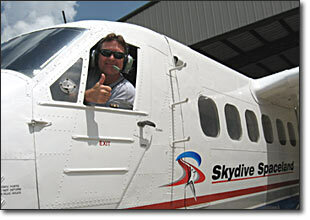 Skydive Spaceland is located on a private 80-acre airpark built for skydiving operations between Austin and San Antonio, Texas, in San Marcos. Get directions below. Do you need help getting to Spaceland? We do not have a shuttle service, but you can usually get out here easily with Uber or Yellow Cab. NOTE: Pilots must contact management via telephone before arrival for landing instructions. **Listen for parachute activity on 123.55 MHz.